The SQL Self Join is one of the Join Type that is used to Join Table 1 to Itself. If we have the Primary key and Foreign key in the same table then, we can use this Self join to connect them. In this article we will show you, How to write Self Join in SQL Server. 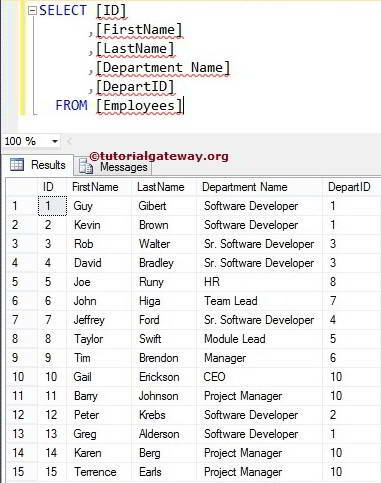 For this, We are going to use Employees table present in our [SQL Server Tutorials] Database. From the above screenshot, you can observe that we have 15 different employees and each person belongs to the Department and we have the Foreign key column DepartID. In general, Every Department will have one Department Head and he will definitely belong to one of the Employee. To get the Department Head name we have to use the Self Join using the Primary key & Foreign key. 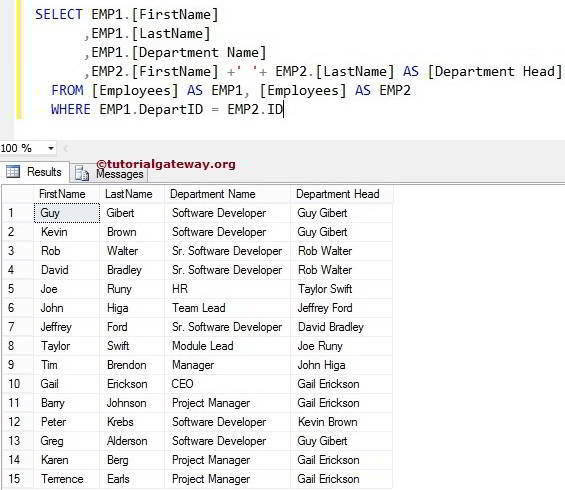 For example, The following SQL Self Join Query will display the Name of the Department Head for each and every Employee present in the Employees table. If you observe the above screenshot, Rob Walter is not only Sr. Software Developer but also Department Head for the remaining Sr. Software Developer in an organization.